1. Make sure the shift lever is in P (Park, for automatic transaxle) or neutral (for manual transaxle) and set the parking brake. 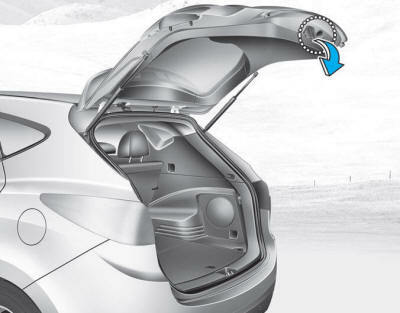 - Press the smart key Tailgate Unlock button for more than one second. 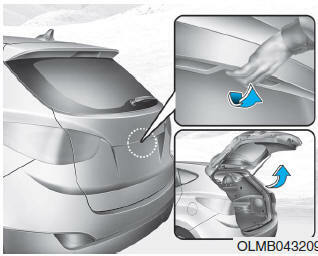 - Press the button on the tailgate itself with the smart key in your possession. - Use the mechanical key. Lower the tailgate and press down until it locks. Always keep the tailgate completely closed while the vehicle is in motion. If it is left open or ajar, poisonous exhaust gases containing carbon monoxide (CO) may enter the vehicle and serious illness or death may result. Make sure there are no people or objects around the tailgate before opening or closing the tailgate. To prevent damage to the tailgate lift cylinders and the attached hardware, always close the tailgate before driving.